I wasn't able to attend Monday's celiac awareness night at the Phillies game, but it seemed as though the event was a success. The team sold more than 500 tickets located in designated sections, raising over $2,000 for celiac awareness causes. Aramark, the stadium concessionaire, set up a stand of gluten-free food items behind the sections that included hot dogs, cheeseburgers, chicken fingers, Redbridge beer and Woodchuck cider. On Tuesday, I reviewed Glutenfreeda Foods' gluten-free burritos, ready-to-bake cookies and instant oatmeal. According to a Twitter post this week, the company is working on another item that will debut in stores this fall. Congratulations to readers Missy and Adriana and Twitter follower jjeterr, who won the Erewhon cereal giveaway. I'll have another gluten-free food giveaway next month. Cafe Monterosso in Yardley, Pennsylvania has been added to the restaurant list. The Italian eatery offers gluten-free pizza, pasta and desserts. I've also listed Essene Market & Cafe in Philadelphia, which serves a variety of gluten-free vegetarian dishes. This past Monday marked the opening of the eighth Iron Hill Brewery location and the first in New Jersey. The chain, which has a gluten-free menu, opened in Maple Shade. A commenter wrote that Sam's Pizza Palace in North Wildwood, New Jersey no longer sells gluten-free pizza. 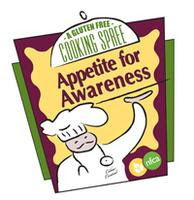 Back in March, I wrote about the Appetite for Awareness event sponsored by the National Foundation for Celiac Awareness. The event will be held on Wednesday, September 30 at the Wachovia Center in Philadelphia, and tickets are now available. Early-bird passes for the main event are available through September 1 for $75 each. Tickets for students and for the VIP event also are on sale. Having attended last year, I can tell you that it's a great event with lots and lots of gluten-free food to eat and take home. I plan on attending and hope to meet some of you there. Two housekeeping notes: first, if you've haven't visited Gluten Free Philly in the last few days, the links to the restaurant and market lists, along with the map links, have been moved to near the top of every page just under the title; second, I won't have a News & Notes post next week. Is the Appetite for Awareness event on 9/30 suitable for kids?